This aircraft is a powered hang glider. It is the powered version of the earlier VJ-23 using a 10 HP engine. The airplane had full three axis aerodynamic flight controls and did not rely on shifting of body weight to maintain control of the aircraft. 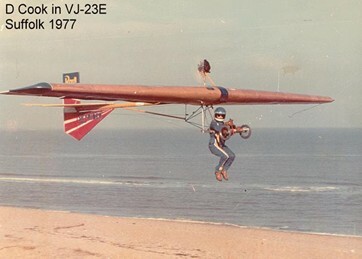 Wing Span 32’ 7” Length 17’ 5” Gross Weight 300 pounds Stall Speed 15 MPH In 1977 David Cook installed a 9 HP McCulloch 101B go-cart engine to his VJ-23E giving it a thrust of about 55 pounds and an airspeed of about 20 MPH. Cook then flew the English Channel from Les Baraques near Calais, France to Northfall Meadow near Dover, England on May 9, 1978. The distance was 31 miles and he completed the flight in about 40 minutes. This was the first hang glider to complete this feat and Cook was awarded a bronze medal for outstanding achievement in aviation. The VJ-23E that Cook flew was displayed over the years at more than 80 major air shows and its highest honor was to be the first flight of the day at the opening of the show at Farnborough in 1980. The aircraft currently resides at the Manchester Air/Space Museum.